Pence decides the only solution is a duel so they meet in a field, each man grabs a pistol and, after taking a few steps, they aim and fire! The Vice President walks away unscathed but, the other man is mortally wounded and dies the following day. 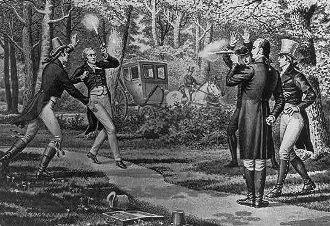 This is EXACTLY what happened on July 11, 1804, when Aaron Burr blew a berry big, donut sized hole out of Alexander Hamilton and set the low bar for Vice Presidential behavior in America. Burr beat both murder and treason charges but he escapes not the infamy of becoming a tasty APR Coffee flavor! The Burr/Hamilton is Mexican fully city roasted beans with our special blend of blueberry and donut flavors. It's a terrific dessert coffee but also a great companion to your favorite pastry breakfast!